Built to match any style. Strong retaining walls may be necessary for structural support, but others are used solely for visual or aesthetic purposes. Retaining walls are carefully engineered to provide drainage and protect level slopes vulnerable to erosion and gravity, giving them a strong, supported, vertical quality. We suggest installing retaining walls to terrace a sloping area to preserve an existing grade, to create a flat space for new landscaping or gardens, or perhaps to protect an existing landscaped area. If you are planning a driveway or landscape, or considering a patio installation, a retaining wall may be needed to support or level a portion of the project. 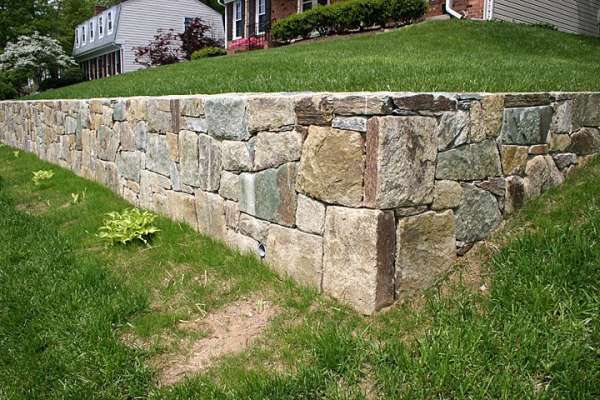 Our design specialists and skilled landscape installers have years of experience designing and installing various forms of retaining walls in Montgomery and Howard Counties in Maryland. Gravity retaining walls are designed to work by leveraging the weight and volume of the hardscape material to counter-balance the force and stress from behind. Cantilevered retaining walls are constructed with an interior piece of strength-treated metal, hardened reinforced concrete, or mortared filament. Sheet pile walls are the right choice for clay soils and narrow areas. 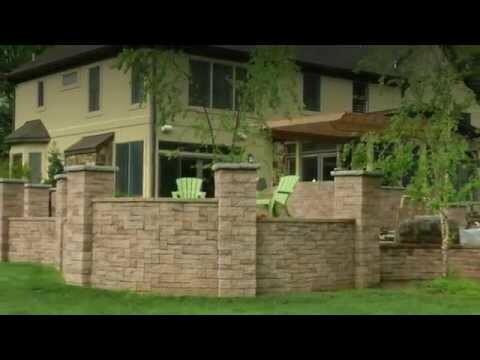 An anchored retaining wall can be constructed in any of the aforementioned styles and provides reinforced wall support.